As we know, professional IP cameras have alarm input and output interface for security integration solution. 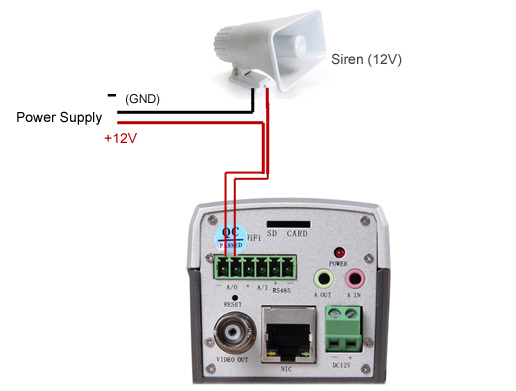 Users can use this interface to connect other security devices such as PIR motion sensor, door sensor, perimeter beam sensor...etc. This article is intended to give a guideline for connecting alarm input/output interface of Vivotek, Axis, Sony, HikVision, Dahua, Messoa,...and more IP cameras. 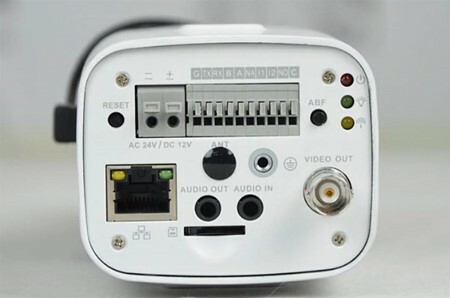 Alarm Input / Alarm Output is a pair of pins in camera's terminal block or connector through which it's possible to connect electronic device with the camera. Alarm Input receives signal from external device, will be triggered from external device if something changes, and Alarm output notifies the external device by the camera upon a event (motion detection, vandalism, video loss). 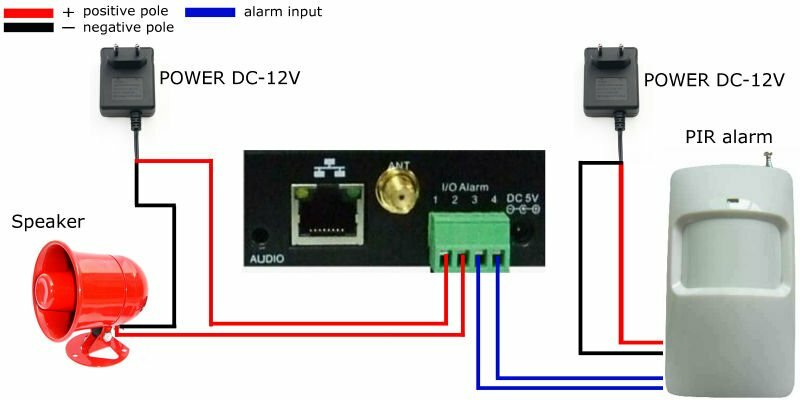 The terms "Alarm In / Alarm Out" are mainly used as the application for alarm system, but they are also called digital input (DI) / Digital Output (DO) as the common terms. 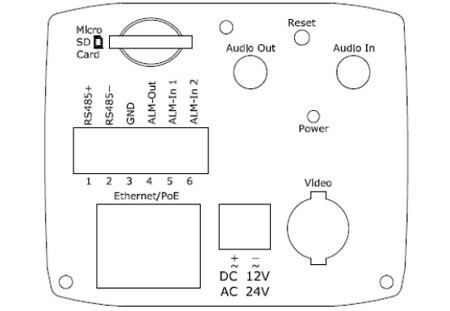 External device connected to Alarm In can be a switch (or say relay), button or any device which can issue a trigger signal. External device connected to Alarm Out can be a light, alarm horn/siren or any kind of device which receives data. SHOULD I USE CAMERA'S ALARM I/O? The main benefit of using camera's Alarm Input / Alarm Output is to respond to the event instantly and automatically by a pre-defined event scheme, and give alert message immediately so that the monitoring control center can handle any situation in a short time to reduce hazard. *Alarm Out (Orange): Connect to a device that responds to alarm signals, such as buzzers or lights. *Alarm In 1 (Red) & 2 (Brown): Connect to devices that issue alarm signals. Up to two (2) input devices can be selected. 1. Connect Alarm In via a switch to GND: Simply connecting Alarm In_1 via a switch to GND with a single wire, as shown above, the Alarm In_1 will be instantly triggered by a press on switch. You do not have to have an external battery to make the “switch” work. 2. Connect Alarm Out: The Alarm out is an open-drain structure, so you have to supply external power source to make the function work. 3. Enable External Alarm: Access the IP camera via Internet Explorer, go to camera's configuration page to enable External Alarms. 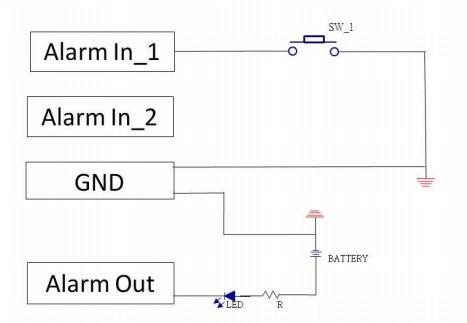 Enable the Alarm In/Out that is connected with external alarm devices and set the voltage level as low or high to define the active state. 4. Validate the setting by pressing the switch and check if it triggers the LED instantly. 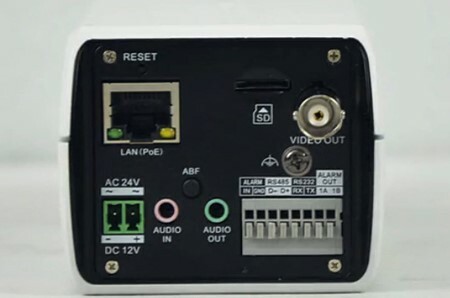 The alarm output ports on the back of IP camera can be connected with a siren or strobe light. Below it's a connection example. The goal is to turn the siren/strobe light on when an alarm is triggered. The working theory is pretty simple, you can imagine the alarm output is a turn on/off switch. In below connection diagram, you need to use extra power supply (for example a AC/DC adapter) to provide the power for strobe siren. You can make connection between IP camera and hard-wired/wireless alarm panel. 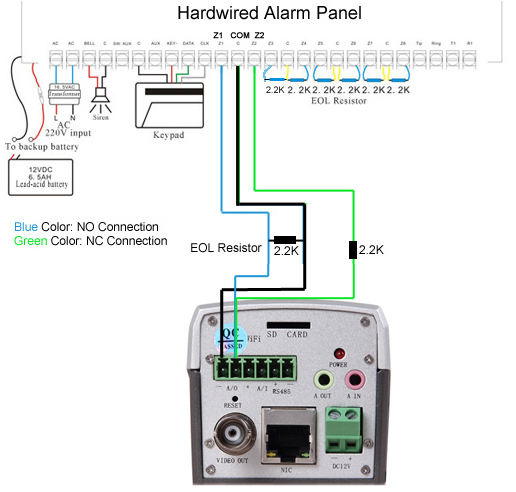 Connect the alarm output of IP cameras to hardwired zones of alarm panel. Please note that you need to use the EOL resistor in this connection. The EOL resistor can protect the circuit of wiring to prevent short-circuit or cut. The EOL resistor should be installed in the end of IP camera. 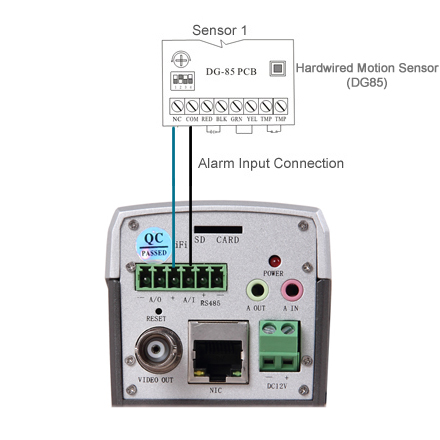 With correct connection, the IP camera can send signal to alarm system for associated alarm action. 1. When alarm output (IP camera) is NC:You need to do the normal close connection. The EOL resistor should connect into circuit in series connection. 2. When alarm output (IP camera) is NO: You need to do the normal open connection. The EOL resistor should connect into circuit in parallel connection. Normal Open: When the device is in the non-triggered state, it's normally closed means that the circuit can allow current to flow from NC to COM, or it turns ON. When the alarm is triggered, the relay is enabled and it will switch from the normally closed (NC) to normally opened (NO) or from Turn ON to Turn OFF. Normal Close: When the device is in the non-triggered state, it's normally opened means that the circuit is open, it doesn't allow current to flow from NO to COM, or it turns OFF. When the alarm is triggered, the relay is enabled and it will switch from normally opened (NO) to normally closed (NC) or from Turn OFF to Turn ON.